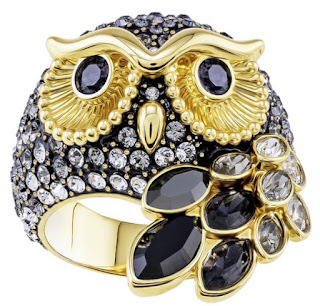 This week I'm obsessed with... Swarovski March Owl Motif Ring! Swarovski March Owl Motif Ring - $199 - a multi-coloured cocktail ring that takes inspiration from the wise owl and makes an elegant statement. Plated in gold, it features a mix of crystals in different cuts and colors and an exclusive Pointiage technique - highlighting Swarovski craftsmanship with an air of vintage glamour. All I know is come Christmas morning, this pretty baby had better be gracing my finger! Available at Swarovski stores across Canada and online at https://www.swarovski.com/en-CA.